Pushpaputa mudra is a gesture of offering a handful of flowers to the Divine. You are the offering – you are the flowers, when you are open to what the Divine lays before you. A great time to try this mudra is after opening yourself up with back-bends. Combine it with pranatasana (child’s pose) and it can help to calm our emotions and bring us back into emotional balance. Note:child’s pose is called pranatasana because it restricts the flow of prana in the legs while increasing the flow of prana in the spine/chakras. Kneel into pranatasana and open the palms of both hands in front of you. Place your face into the palms of the hands. If your head does not comfortably rest into your hands, then elevate your hands on a blanket or block. Rest. Consider what you would like to offer or release to the Divine. When you feel ready, come back to kneeling in an upright position. 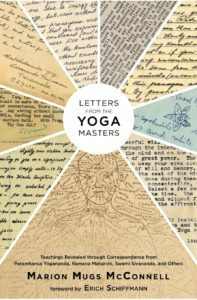 This is a sneak peak into Mug’s book “Letters from the Yoga Masters.” Join Mugs McConnell for a weekend or 7 days, immersing yourself into classical yoga practices and techniques.